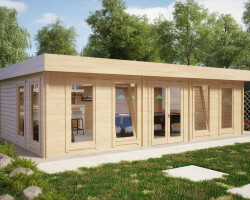 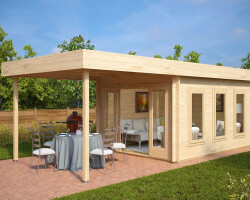 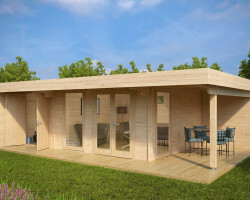 In M-category, check out the most popular 8 m²- 21 m² garden summer houses. 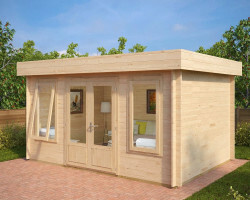 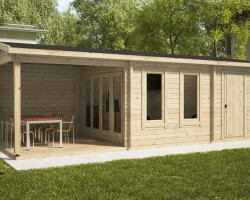 Whether you are looking for a large wooden shed, a spacious garden room or a modern garden office, this is the ideal size. Installation of these medium-sized garden log cabins is a one or two- day DIY project for two persons. 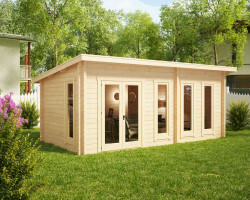 If you are not a DIYer, you can have your garden summer house or a shed assembled by our competent Hansa Garden construction team. 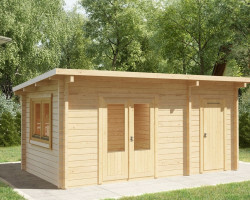 Hansa Garden has over a hundred medium-sized wooden summer houses to choose from. 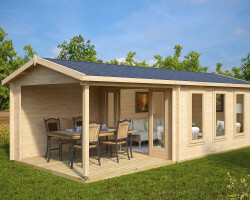 Medium-sized garden summer houses comprise almost half of our full product range. 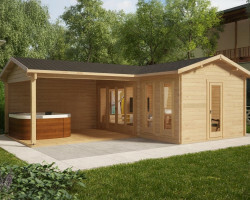 We have been working hard to satisfy as many different tastes as possible. 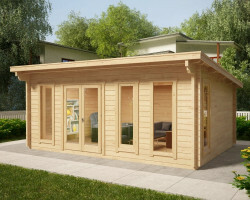 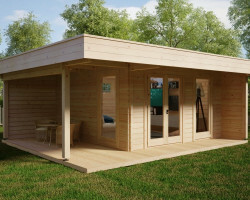 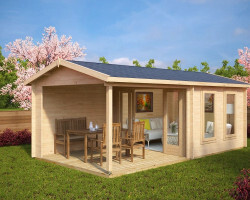 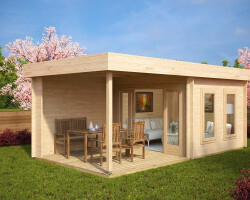 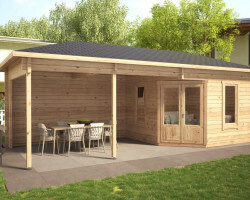 Choices include: summer houses with veranda, modern garden rooms, traditional log cabins, modern garden offices with lots of light, large garden sheds for DIY projects and so much more you can find in our selection of medium sized wooden garden buildings. 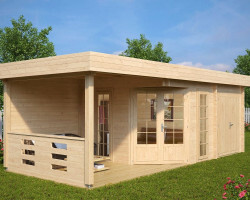 Medium-sized summer houses with Hansa Garden standards have everything you need included in the product price. 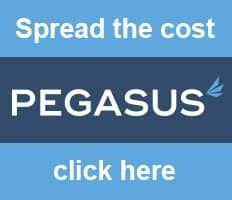 That is why we don’t use “prices from”. 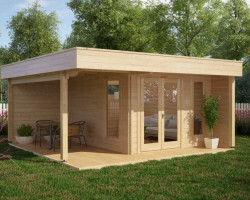 Our small garden cabins with most affordable prices have 28 mm wall thickness. 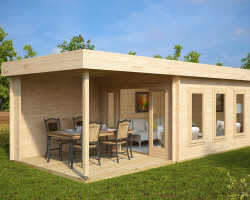 Most of medium-sized summerhouses come with 40-44 mm walls. 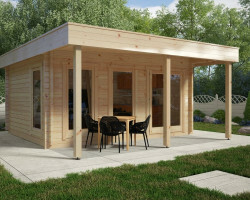 All of them have solid 18 mm flooring, 18 mm roof boards including roofing felt and assembly kit. 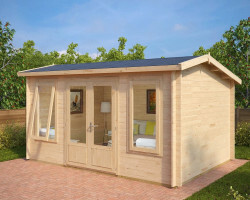 All of our garden sheds and wooden cabins with 28 and 40 mm thick walls have single 3 mm glazing in windows, all garden buildings from 44 mm walls and thicker have double glazing in windows. 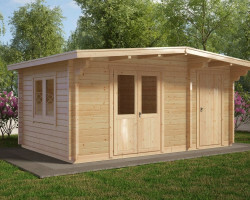 All flat pack log cabins are carefully delivered, waterproof packed and have a five-year factory guarantee. 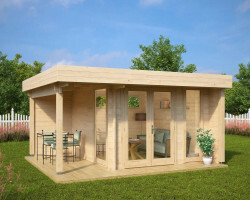 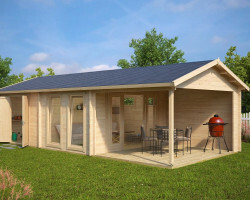 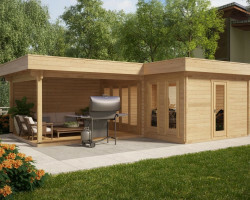 In addition to our garden summer houses, you can find garden sauna cabins, BBQ huts, wooden gazebos, arbours, and wooden grill pavilions from M- category garden buildings.